Peter and Vadim are long-term contributors to MySQL open source code base and are the founders of Percona, MySQL consultancy. This is really THE book about MySQL written by engineers who have spent more than a decade working on MySQL code. The book is equally valuable to devops and DB admins, as well as software developers. It assumes that you have a good working knowledge of MySQL, as it dives straight into the intricate details of the system architecture and performance fine-tuning. I have first-hand experience using second edition of this book, and I can say that it paid itself back many times over when I was debugging critical performance issues I came across in HeiaHeia.com operations. 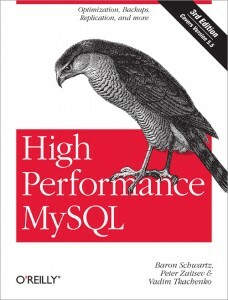 Now this third edition (published in 2012) covers also new features in MySQL version 5.5. In this new edition authors make real effort to explain not only how MySQL works, but why certain features in MySQL work the way they do. Case studies peppered throughout the book are particularly interesting, as they give insight into how to deal with MySQL in large scale setups with high load and demand for high availability. This book covers a lot of very complex topics from replication, clustering and sharding to high availability. Practical advice on how to profile your server, find and fix the bottlenecks in server setup as well as on the application side in SQL queries is invaluable. I very much liked that book is organized in such a way that it can easily be used as a reference. This is a must read for anyone who has a somewhat significant load on their MySQL DB server or is considering moving from a single server setup to a cluster. Get your copy of the book at O’Reilly.